Pets Costs > Cat Breeds > How Much Does the Chinese Li Hua Cost? How Much Does the Chinese Li Hua Cost? The Chinese Li Hua (pronounced lee-wah), or the Dragon Li, Li Hua or Lu Hua Mao, is a natural cat breed that evolved for hundreds of years in China. It is thought to be known as the earliest domesticated cat as per evidence found in old books. This native, shorthaired breed is considered rare and is recognized as one of the earliest known breeds of domestic cat. It was recognized as a breed only at the end of 2003. How much does the Chinese Li Hua cat cost? The pricing for the Chinese Li Hua, as with most cats, will greatly depend on the quality, gender, applicable markings, bloodlines, breeder and geographical location. Costs, from what we researched, are often between the $400 to $900 range for a high-quality breed kitten. When compared to other cat breeds on the market, the Chinese Li Hua is very hard to find in the United States. Even if you were able to find one, there’s a good chance that breeder will have a six month to one-year waiting list and you will have to pay an additional fee to have it shipped to the states. A reputable breeder, upon adoption, should include registration paperwork, a health certificate from a licensed vet, some sort of health guarantee and all vaccinations required at the time. If the cat is going to be shipped, an airline-approved cat carrier will be included as well. As mentioned, since this breed is hard to find, there’s a good chance you’re going to have to purchase the cat from China, meaning you could be spending hundreds in shipping costs alone. As with any cat, all of the recurring costs need to be considered. This will include cat food, cat litter, toys, miscellaneous accessories and routine/surprise vet visits. A healthy cat can easily cost more than $400 to $600 a year, whereas a health problem could double or even triple these costs. In the cat’s first year, immunizations, a spay/neuter, if the breed doesn’t include it, and a microchip, all need to be factored into the budget. The same can be said for those who have never owned a cat before and need to buy all of the starter supplies such as cat litter boxes, food bowls and toys to name a few. 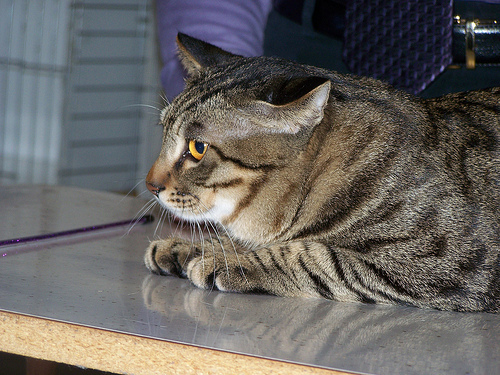 The Chinese Li Hua is a large, sturdy breed with a short, smooth coat that comes in a single color, brown mackerel tabby. It has round legs that are thick and muscular. It matures relatively slow and can take up to three years to reach full size. Generally, female Chinese Li Hua cats are smaller in build, weighing no less than 8 ½ pounds, compared with males that weigh over 11 pounds. The cats are recognized for their deftness in hunting rats even during the ancient times. The Chinese Li Hua is active and mild-mannered and makes an ideal pet for households with children over 10 years old and cat-friendly dogs. Most Chinese Li Hua breeders make kittens available between 12 and 16 weeks old. After reaching 12 weeks of age, the kittens have had their basic vaccinations and have acquired the physical and social stability necessary for showing, air transport, and survival in a new environment. Chinese owners have been known to hold weddings for their cats. The Chinese Li Hua has a short coat and no undercoat. Groomers recommend brushing their coat weekly to keep the coat shiny and help prevent hairballs. VetStreet.com states that if you’re adopting from China and having it shipped from a breeder overseas, you will need an International Health Certificate to prove the cat is healthy. A rabies vaccination is highly recommended as well. Even though it isn’t required for the cat to enter the United States, many airlines will require it in order for the pet to board. These cats are highly prone to periodontal disease and daily dental hygiene is highly recommended. Its average lifespan ranges from 12 to 15 years. They are recognized by the US CFA (Cat Fanciers Association) and by the Chinese CAA (Cat Aficionado Association). Instead of buying a Chinese Li Hua kitten, think about adopting one via a local rescue or adoption facility. Even though it will probably be hard to find one, it doesn’t hurt to contact your local animal shelter or rescue group and find out what breed of cats they are putting up for adoption. You never know if you’re able to find a cat that closely resembles the breed. Aside from being able to provide the animals a new home, the cost of pet adoption is very minimal.